This post has sat in my draft folder for a couple of weeks and I have experienced many great meals since, but St. Louis provided enough culinary pleasure that I want to share it. I was fortunate to present at the Popular Culture Association/American Culture Association conference in early April. With even more good fortune, my presentation, Cooking by the Book: New American Cuisine and the Production of a National Gastronomic Discourse, was scheduled for Thursday afternoon, leaving plenty of stress-free time to explore the city. 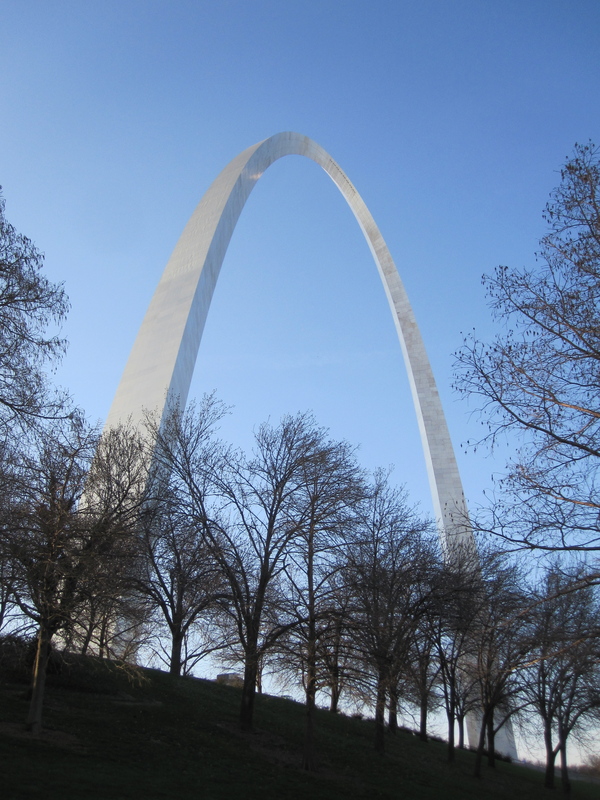 The conference took place downtown St. Louis, just a few blocks from the Gateway Arch. The hotel housed Larry Forgione’s An American Place, which, as obvious from the title of my presentation (Forgione’s 1996 cookbook, An American Place, was one of my focus points), was a source of great excitement. I got to interview Nick McCormick, the chef de cuisine at An American Place, a couple of hours after landing, and went back for a celebratory meal with my co-panelist, historian Megan Elias. The real highlight of the week, in this assortment of terrific food in a city where I wasn’t sure what I’d find, was incontestably Chef McCormick’s cooking. Of course, having spent quite a bit of time talking with him about his cooking philosophy, influences, training, and more the day before meant that I did not approach the meal like a blank slate. But Megan did—other than her interest in An American Place and Larry Forgione, driven by her work as an historian of American food—and she concurred. His food was creative, inspired, and perfectly executed. It celebrated the best ingredients that Missouri, but also America, has to offer, following the principles Forgione established in the 1980s but in a way that was completely contemporary. My photos don’t do his food justice, but the highlights were the shrimp cocktail—a clever take on the satisfying classic dish, with spicy tomato spheres—baby lamb with fiddlehead ferns, trout terrine, and a terrific charcuterie plate. The desserts were also twists on classics, s’mores and peanut butter and jelly, but not done in a cliche way as is the case in too many restaurants that have reinterpretated those dishes in the last decade. Everything we ate felt “fresh” in its interpretation, with a smart, well edited use of experimental techniques. A chef to follow. We also had to try Niche, since chef-owner Gerard Craft was just nominated for a James Beard Award in the Best Chef: Midwest category. My favorite dish was the fried pig head appetizer—a crispy, flavorful, and rich preparation that I couldn’t stop eating. On Chef McCormick’s and our wonderful waiter at An American Place, Giovanni’s, recommendation, I also went to Monarch for a solo dinner. Josh Galliano, the executive chef, worked at An American Place and at Restaurant Daniel in New York. The celeriac soup, pork belly, grits and morels, and strawberry shortcake were all seemingly simple dishes that had complex and rich flavors. Not to forget barbecue, at Pappy’s Smokehouse, and Ted Drewes for frozen custard. Neither of those disappointed, and both were worth their long lines. The ribs at Pappy’s Smokehouse are dry-rubbed and then slowly smoked over apple and cherry wood. An assortment of sauces is available on each table, but none are needed. I would never admit that in front of my father in law, but those were the best ribs I’ve ever had. The sweet potato fries are tossed in a mixture of spices and sugar, which makes them dangerously addictive, and the baked beans were rich without being too sweet. 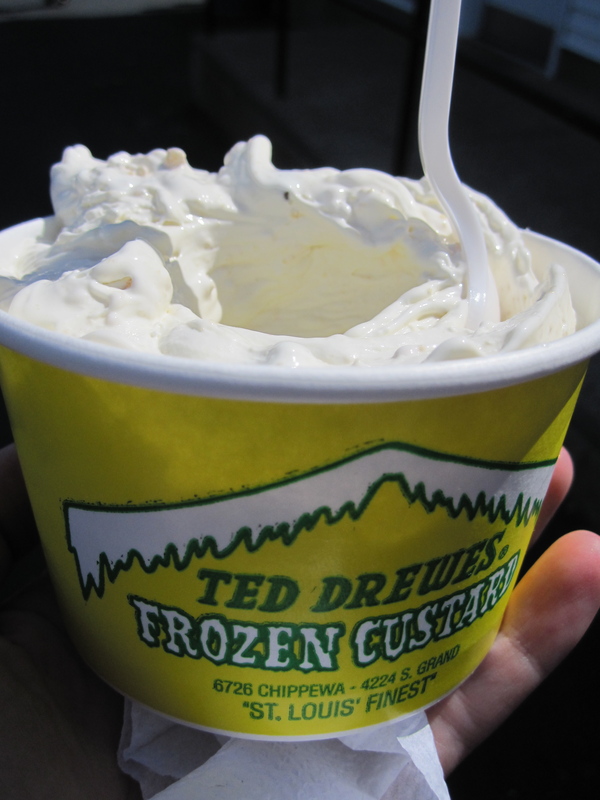 The cookie dough frozen custard at Ted Drewes was expectedly sweet but nonetheless delicious. I had to do a lot of walking in a city not really pedestrian-friendly to offset these meals, and am grateful to the Mississippi boarwalk and Forest Park to allow for that. St. Louis was full of surprises and I hope to go back. The next out-of-New York post will cover Portland, OR, one of the most amazing food cities in the US right now, if I can be so categorical.